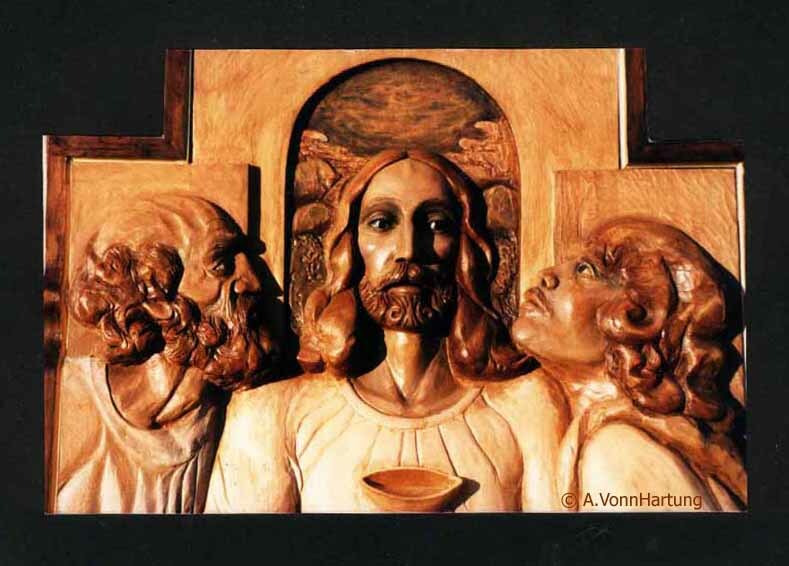 I am an artist of Catholic Sacred Art, primarily a painter and wood sculptor, although I’ve done major works in mosaic, ceramic sculpture, portraits and serigraphs. I have principally dedicated the gift I found I had, to the will and needs of the church; in doing so I have worked with materials that were most readily available and affordable to fulfill the requirements of the work that was needed. I came to my art first as a tradesman, a skilled worker. My father was a carpenter and as a teenager I built houses with him; my brother an ironworker and so I worked on permit with him while in school. I wandered a great deal as a young man (I’ve worked as a fisherman, cowboy, carpenter, mechanic, longshoreman, merchant seaman and sign-painter). And so it was late that I came to formal education in the university, and although I thrived there, eventually earning a Bachelor of Fine Arts degree with honors from University of Hartford while also pursuing independent studies in Mexico, I knew college was but a shelter, a stopping-off place, and that the comfort it afforded was not for me. I needed the challenge, the risk and even the uncertainty that drives artistic creation. Early on I was inspired by the great master Michelangelo, and I’ve always been deeply moved by Catholic art ever since the first time I encountered it as a child in our local church St. Joseph’s in New London, Connecticut; the stained glass windows, the painted murals, the wood carvings of the Stations of the Cross and the marble statues of Christ, His mother Mary and His saints. Since 1984 I have lived in Guaynabo, Puerto Rico where I dedicate my life and art to a search for the spiritual dimensions of human nature as well as God’s beauty revealed in Creation. Through my paintings, portraits, sculpture, serigraphs and murals I seek to reveal the Light within. 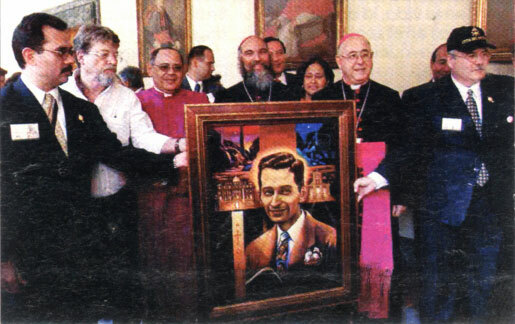 A defining work came in the year 2001 when the Archbishop of San Juan, Puerto Rico, Monseñor Roberto González Nieves, O.F.M., commissioned me to paint the official portrait of the first Blessed of Puerto Rico, Carlos Manuel Rodríguez Santiago. It hangs in the Hall of Saints of the Pontifical North American College at the Vatican. Art defines for me the gateway to a deeper reality. In a world that moves too fast it is my braking mechanism, the search-light of my direction, the balance point of my stability. In a world of detached science and ephemeral technology, it is my intimate link with my Creator. To state a beauty of whatever kind is to continue an action that has always been and will never cease as long as we hold the capacity to marvel, to be transported into that beauty which transcends the ordinary and gifts us with a glimpse of the divine. I continue to marvel at how beauty happens as I work from the inspiration I receive from the Miracles and Scripture. For me art is an act of salvation. Hi Tom. Yes of course! It’s good to hear from you after all these years. When in the Spring might you be coming? 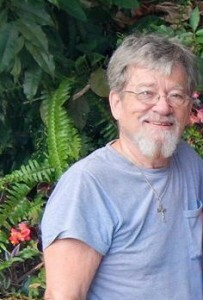 Let me know through an email at vhartung@msn.com and we can be in touch. All the best to your family. Patty sends her regards.